A mythical land of mountains, fjords, and glaciers, Norway is a Scandinavian country, located in Northwestern Europe. Both a true winter wonderland in the colder months and a haven of lush greenery and sparkling fjords in the summer, a holiday to Norway is the perfect choice for lovers of nature and the great outdoors. You cannot experience landscapes much greater than those found in this country. Bordered by Finland, Russia and Sweden, and separated from Denmark by the Skagerrak Strait, the nation of Norway is famed for being the land of the Vikings, a heritage that can be relived today in the Viking Museum in the capital of Oslo, a cosmopolitan city sat on the head of the Oslofjord and known for its green spaces and cultural offerings. As well as the mainland, the territory of Norway also comprises the remote Jan Mayen volcanic island and the Svalbard archipelago, one of the world’s most northernmost inhabited territories. Famously a very prosperous country, Norway has a strong economy and is known for having the highest Human Development Index rating, indicating that Norwegians have the best quality of life in the world. With captivating landscapes, brilliant amenities, diverse cities, and endless opportunities to immerse yourself in nature, a tour of Norway is an attractive choice for all travelers. Although the first settlers in, what is today, Norway, can be traced back to the end of the last Ice Age, when they lived as hunter-gathers, the most famous era in the human history of the country is, of course, the Viking Age. Between the 8th and 10th century is considered the most active period in the history of Norway’s Vikings. They traveled, explored and raided many settlements across the British Isles and North America, showing impressive navigation, organization and battle skills. They also discovered Iceland in the 9th century. The Vikings still remain in the popular memory today, famed for their long-tailed ships, Norse mythology and fearsome reputation. In the 10th century, the Viking leader King Harald Fairhair unified the country and the traditions of the Vikings began to wane and fall out of popularity to be replaced by Christianity. In the 13th century, Oslo became the center of power and although parts of Norway were integrated into both Sweden and Denmark throughout the following centuries, in 1905 it gained complete independence. Today, Norway is a global champion of egalitarian ideals and its inhabitants are proud of the country's long history and progressive politics. 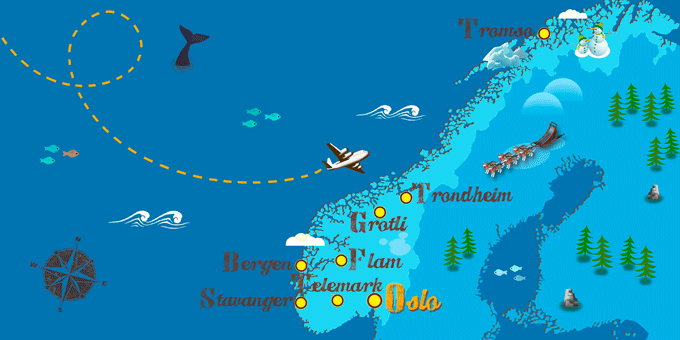 A package holiday to Norway will no doubt focus on the fabulous landscapes and natural environment of the country. With an astonishing 4000 lakes and almost 240,000 islands scattered around the vast, rugged North Atlantic coastline, there is certainly a lot to explore. The country’s fjords are a highlight for travelers, deep grooves that were cut into the land during the last Ice-Age, filled with sea-water. The Sognefjorden is the most famous of all of Norway’s fjords, the second deepest in the world, and located in Sogn og Fjordane county in the west of the country. A cruise on this famous body of water is an unmissable experience on a trip to Norway. Other notable fjords include the Geirangerfjord and Naeroyfjord. The remote Svabard archipelago is the best place to discover the abundant and unique wildlife of the country, unlike that found in other European countries. Here, arctic animals such as polar bears, walrus, and arctic foxes wander the snowy landscape, whilst the elusive puffin can also be sighted in the archipelago. Throughout the country reindeers and moose can be found, and in the cold North Atlantic waters, orca, humpback and sperm whales can be seen in the winter months, making it a popular destination for whale-watching cruises. In the Reisa National Park, located in the county of Troms, lynx and wolverines roam freely amongst the landscape of woodland, waterfalls and rocky gorges, as well as golden eagles who sweep through the bright arctic skies. Of course, the dazzling Northern Lights can be sighted in the northern parts of the country, particularly in the area between Bodø and Svalbard, if you are brave enough to face the brutal winter weather. Aside from the natural wonders of the country, Norway has an array of interesting cities and towns, each with their own particular charm. Oslo attracts visitors with its modern appeal, cosmopolitan atmosphere and cultural delights. It is known for having a fantastic food scene and for its innovative Vigeland Sculpture Park, which displays the works of Gustav Vigeland in an open-air setting. Bergen, the base for many adventures on the fjords, was once a center of the Hanseatic League's trading empire, and charms visitors with its brightly colored historic buildings and old wharf. The Bryggen area of Bergen, a row of traditional buildings sat on the harbor, is a UNESCO World Heritage Site. Many visitors on a tour of Norway choose to enjoy a ride on the Flåm Railway, a 20-kilometer long railway line between Myrdal and Flåm, which runs through the picturesque valley of Flåmsdalen and allows riders to take in the pristine landscape from the comfort of the train. Norway is a very proud country with a culture closely linked to its unique history and geography. The 19th century saw the emergence of a strong romantic nationalist movement in Norway which focused on the unique nature of the country’s culture, landscapes, language and folklore, something which still exists today in the popular imagination and public sphere. An example of this can be seen in the traditional Norwegian fairytales of Ashland, ‘the small man who succeeds where others fail’, perhaps a metaphor for the country itself. Norway has a strong tradition of fish farming, evident in the country’s cuisine which focuses on fish such as salmon, trout, and cod, alongside dairy products, all of which are produced within the country. Notably, the Nobel Peace Prize is awarded each year in December in Norway. Norway; a country of prehistoric glaciers, snowy mountains, quaint fjord-side villages, rugged coastline, a strong Viking heritage, and proud national culture. A trip to Norway is a unique experience filled with scenic drama to excite all travelers.